Consumers are more concerned about data privacy than ever before. It is the No. 1 social issue that Americans would like businesses to address. Even ahead of healthcare. Regulations like the EU’s General Data Protection Regulation (GDPR) and the California Consumer Privacy Act 2018 (CCPA) – and a host of other new regulations being developed around the world – are attempts to calm those fears and force companies to be better stewards of their customers’, or users’, data. Yet the new regulations don’t seem to have had an immediate calming effect. Several months after GDPR was enacted, a Global Web Index survey found that 70% of internet users in the UK and U.S. were more concerned about their online privacy than a year earlier. In this kind of environment there is a tremendous opportunity for forward-thinking companies to build a competitive advantage based on good data stewardship. Data privacy is the No. 1 social issue that Americans would like businesses to address. Even ahead of healthcare. We have entered a new privacy paradigm. Privacy rights management used to mean protecting your customers’ data. Today also means enabling your customers to exercise control over their data. Yet it’s a misconception that personalization and privacy are conflicting efforts. In fact, they’re symbiotic opportunities to deliver business value. Leverage customers’ data to deliver more personalized products and services to them, and at the same time be a good steward of that customer data. It’s a misconception that personalization and privacy are conflicting efforts. In fact, they’re symbiotic opportunities to deliver business value. Being an effective steward of your customers’ data can be a key differentiator as you acquire new and deepen existing customer relationships. Delight your customers with clarity, speed, and education. This is the number one way to deliver transparency to your data subjects. Unlike a basic web form, a privacy portal is a space in which your users can self-administer some or all of their privacy requests. A portal enables the secure transfer of sensitive information with a password and SSL encryption. You can communicate disclosures, past consent(s), and open and closed requests. Intelligently designed workflows make the process easier and more understandable. A matrix of consent helps manage complexity by tying data categories (profile data, social data, contact info, income data, etc.) to data uses (app, new account, loan application, etc.). The matrix shows the type of data used by service. It shows what data subjects have agreed to, what they have specifically revoked access to, and what data does not apply to a particular service. It provides easily understandable transparency into the ways your access to a customers’ data enables you to provide their services. There are other best practices in privacy rights management of course, including practices that reduce operational overhead by automatically deleting or anonymizing records across hundreds of back-end systems. But these three are the key ones to delight customers and thereby gain competitive advantage. Being an effective steward of your customers’ data can be a key competitive differentiator. Delight your customers with clarity, speed, and education. None of this is easy. 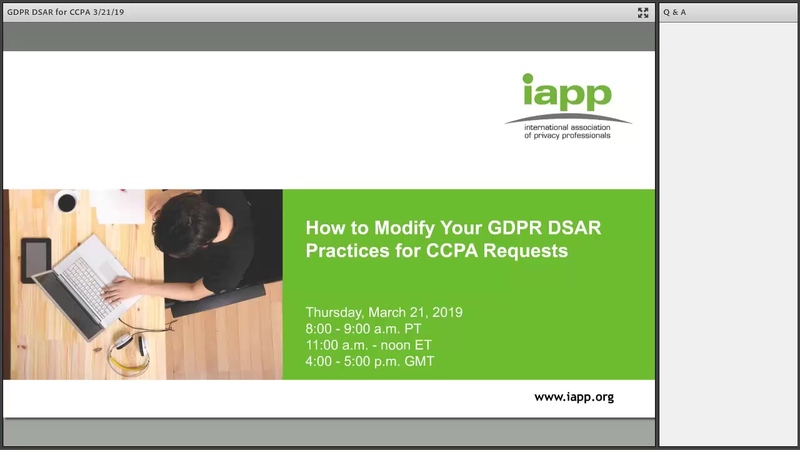 For most businesses, managing data, alerting users to their rights, and responding to data subject access requests is an overwhelming amount of work. Making it more difficult is the fact that data privacy regulations continue to change. The ideal solution is a complex piece of software that can navigate through the different regulations and render a complex web of rules into a platform that can be easily understood. The Apples and Microsofts of the world are building their own such software. For most companies, that’s not the best approach. A software-as-a-service solution for privacy rights management has all those same benefits, which go a long way to delivering flexibility for today’s uncertain privacy rights environment. Indeed, in their July 2018 survey, TrustArc found that 87% of companies are looking to a third party to help meet GDPR compliance requirements. More than half use third-party technology and tools to automate and operationalize data privacy. 87% of companies are looking to a third party to help meet GDPR compliance requirements, according to TrustArc. By turning to a purpose-built SaaS solution, you can focus on building trust with your users and customers and understanding what the data means. And that can be a huge competitive advantage to the business that is your primary focus.